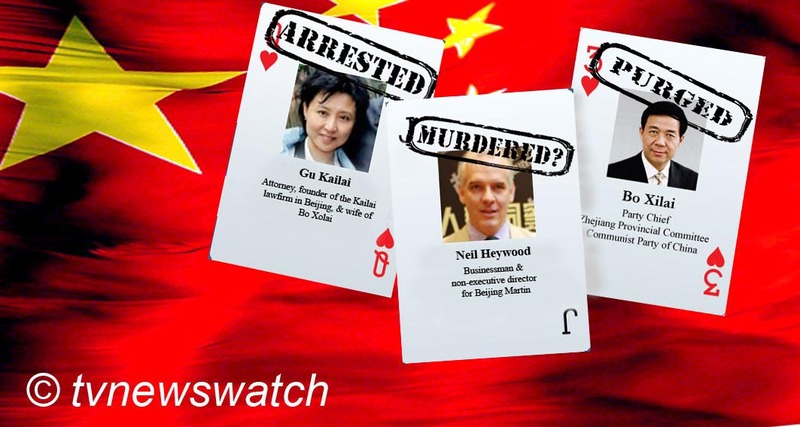 The wife of ousted Chinese official Bo Xilai has been arrested in connection with the death of British businessman Neil Heywood who was found dead in his hotel room in November last year. Gu Kailai and the family orderly Zhang Xiaojun have both been implicated in what is now being described by authorities as murder. The case has captured the imagination of western commentators and many Chinese netizens since Bo Xilai was ousted from his post as Chongqing governor on the 15th March [tvnewswatch: Bo Xilai purge, a return to dark days of Mao]. Wild rumours have circulated as to why he was purged from the party with speculation that he may have been involved in a planned coup with close supporter and member of the Politburo Standing Committee Zhou Yongkang. The speculation surrounding a coup attempt dissipated, helped by a broad sweep of censorship on Chinese micro-blogs [tvnewswatch: Rumours of coups & crashes point to unease in CPC]. But last month questions were raised over the death of the British businessman Neil Heywood who had close ties to the Bo family [tvnewswatch: 'Suspicious death' of Briton with links to Bo Xilai]. The speculation surrounding Heywood's death might also have been buried had Bo Xilai's ex-chief of police Wang Lijun not sought sanctuary at a US consulate in Chengdu on 6th February this year. Wang had apparently tried to meet British officials but never turned up at the appointed time. The reason for his failing to attend that rendezvous is unknown but a short while later Wang went to the US consulate where, it is believed, he divulged what he knew about a possible murder which the Bo family were somehow involved. After a stand-off with Chengdu police, Wang eventually exited the consulate and was taken into custody. He has not been seen in public since. At this time none of the authorities were forthcoming. The US would only confirm that Wang Lijun had visited the consulate, but would not reveal further details. Days later the British divulged details that the former police chief had sought a meeting with them but had failed to turn up. Meanwhile the Chinese authorities stayed quiet. Even after the British asked that an investigation be re-opened into the death of the British businessman, the Chinese remained suspiciously quiet. When Sky News reporter Holly Williams asked a spokesman to comment on the case, he responded with apparent denial that anything untoward had taken place. "I have no information on this topic," Hong Lei, the spokesman for the Ministry of Information, said. But after two weeks of investigations Chinese authorities have broken their silence. In an article published by Chinese state media [Xinhua - Chinese / Xinhua / China.org.cn - English] yesterday [10th April] it was revealed that Neil Heywood was likely to have been murdered and that Bo Xilai's wife, Gu Kailai was the main suspect. "Police authorities paid high attention to the case, and set up the team to reinvestigate the case according to law with an attitude to seek truth from facts," a statement in broken English said. "According to investigation results, Gu Kailai, wife of Comrade Bo Xilai, and their son were in good terms with Heywood. However, they had conflict over economic interests, which had been intensified," the article read. "According to reinvestigation results, the existing evidence indicated that Heywood died of homicide, of which Gu Kailai and Zhang Xiaojun, an orderly at Bo's home, are highly suspected." The re-opening of the investigation into the death of Heywood and the arrest of Gu Kailai appears to be more a process of damage limitation and re-establishing party control. With a change in leadership due to start in less than six months, a scandal of corruption and murder, particularly that of a foreign national, will have created great unease in the top ranks of government. An editorial in the People's Daily, the newspaper that the Communist party uses to communicate to its cadres across the country, said Neil Heywood's death was a "serious criminal case" and that "Bo Xilai's actions have seriously violated the party's discipline, caused damage to the party and to the country, and harmed the image of the party and the country" [People's Daily / Xinhua]. Heywood's death was conveniently ignored by authorities at the time. Two explanations were issued as to how he died, his family being told he died from a heart attack while police filed that he had died from excessive consumption of alcohol. There are also questions as to why the businessman was cremated so soon after his death, who authorised it, and why no autopsy was performed. Little if any of this information may have come to light had Wang Lijun not gone to the US consulate in February. The Internet rumours, which have been heavily censored, have also helped to keep the case alive. But after official questions were put to the Chinese government by British authorities, Heywood's death could no longer be buried. Neil Heywood's family who seemed satisfied that he'd died of a heart attack will no doubt be angry at learning he was murdered. Family members had been dismissive of the speculation surrounding Neil Heywood's death. "It's preposterous. The more description (in the media), the darker it becomes," one family member said, occasionally breaking into tears in an interview in the lobby lounge of a hotel on the outskirts of Beijing late on Thursday 29th March. The family denied reports that Heywood was a spy and that he was cremated against their wishes. "We requested the cremation. We were not forced to do so. We have no doubts about the police report," said one family member [Guardian]. However the family has yet to release any statement concerning the latest reports. As for Bo Xilai he has been stripped of all his party affiliations. The Central Committee of the Communist Party of China (CPC) has decided to suspend his membership of the CPC Central Committee Political Bureau and the CPC Central Committee, in line with the CPC Constitution and the rules on investigation of CPC discipline inspection departments, Xinhua reported [Xinhua - Chinese / Xinhua - English]. His whereabouts remain unknown, though he is believed to be held under house arrest in the coastal city of Beidaihe, some 260 east of Beijing. Despite official statements, China is still stamping out any speculative discussions on the case. Any mentions of Bo Xilai, his wife or Neil Heywood are being expunged from China's micro-blogs, in order to quash rumours [Reuters]. The real truth behind the events that left Neil Heywood lying dead in his Chongqing hotel on 15th November last year may never be known. Heywood had many business dealings in China and was involved with Hakluyt & Co., a firm set up by former MI6 operatives [Guardian / Telegraph]. The connections may have been a concern to Chinese authorities if previously known, but the recent publicity surrounding Heywood's involvement with companies connected to the intelligence community have also rattled organisations and bodies outside the country. In an article published on 31st March, John Donovan discusses the "Chinese whispers" that point to a possible link to Heywood's untimely death. In particular he discusses the petro-chemical company Shell's displeasure at being associated with Hakluyt, saying that Shell was "not pleased by these latest reports of its involvement in the 'murky world of corporate intelligence' and has been keen to play down Heywood's role." "Given the apparent role of Mr Heywood in China as a deal fixer with high level connections, and Shell's long association with Hakluyt, I wondered whether Mr Heywood and/or Hakluyt, had any involvement/connection with the shale gas deals recently announced by Royal Dutch Shell?" Donovan asks, in an email to Michiel Brandjes, Company Secretary & General Counsel Corporate of Royal Dutch Shell PLC. There is speculation that Gu Kailai may have had an affair with the businessman, though the truth of these rumours is unsubstantiated. Bo has previously been quoted as saying that people had been out to "get him" by deliberately "pouring filth" on his family. According to one source Wang Lijun told central investigators that Gu Kailai turned on the British man because of economic interests and that she wanted to destroy Heywood. British authorities have been reluctant to say too much concerning the recent announcement for fear of prejudicing the investigation. Speaking to Sky News on Tuesday British Foreign Secretary William Hague said, "The Chinese are doing what we asked them to do, and we now look forward to see those investigations take place and in due course hear the outcome of those investigations." "I don't want to say any more than that because having asked for the investigations I don't want to prejudice their conduct in any way," William Hague added.